Using SEOtastic’s services, you will achieve positive rankings in all the popular search engines such as Google, Yahoo, and MSN. Using both our organic and natural SEO services, not only will have the ability to increase your exposure to your target market demographic, but you will also increase the overall volume of traffic to your website. We’ll gladly demonstrate this for you by simply signing up for our free SEO Website analysis audit. We’ll also show you how you can accent the brand and by adapting a wider and more extensive marketing strategy. SEOtastic will provide a strategy to ensure that you gain prominence with the various search engines that’s flexible enough to allow your preferences. We will also ensure that your website’s structure is more effective, allowing visitors to experience its usability and relevance. This is where on-page optimisation comes into play involving various key functionality. On-page optimisation is also effective in fixing errors. Redundant URLs will be amended and various canonicalization issues will be browsed. Any 404 errors will be fixed by repairing the broken links and sending the site back to its page. Various XML and HTML tags will be created so that the page will be usable for both the visitors as well as the search engine spiders. The location of your web hosting will be checked to guarantee that the W3C standards are being observed. We can also help you improve your website by cleaning up the unnecessary Meta tags and descriptions and new sets of keywords may be adapted to better suit your campaign. Duplicate contents will also be removed and on-site images will be optimized so that they won’t affect your ranking. The content will also be amended to ensure that it’s optimized and can attract more internal links. A dynamic RSS feed will be created to complement the whole SEO directory structure. It will also integrate the WordPress blog to various SEO-friendly plugins and link it with your homepage. Our off-page search engine optimisation services can also be useful in the creation of external back links, allowing an increase in your web exposure. Relevance is the most important aspect of off-key SEO services and we can help you to build a natural linking profile. We can also help you in the creation and submission of quality articles to a wide range of tailored articles directories. There will be press allowing you to increase your global reputation. Your rank and ROI can be significantly improved with the proper utilization of on-page and off-page search engine optimisation services. This can also be crucial for brand recognition and reputation. 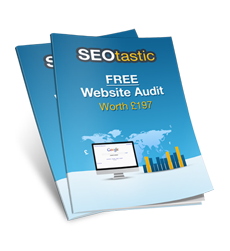 Please contact SEOtastic if you would like a free SEO audit of your website.